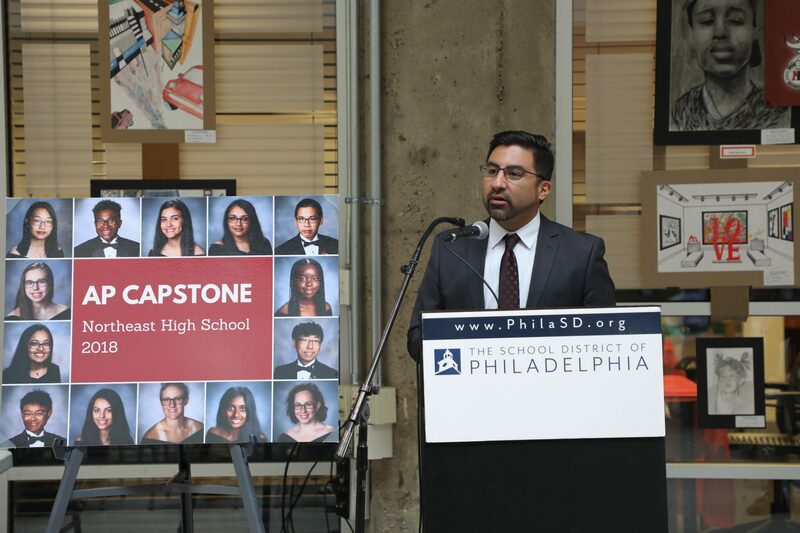 PHILADELPHIA – The School District of Philadelphia celebrated the first student graduates of Northeast High School’s Advanced Placement (AP) Capstone program, a rigorous, two-year diploma program designed to prepare students for college and career by developing their critical thinking, collaboration, time management and presentation skills. Dr. William R. Hite, Superintendent, was joined at an awards ceremony at the Education Center Tuesday by Mayor Jim Kenney; Board of Education President Joyce Wilkerson; Board members Julia Danzy, Dr. Maria McColgan, and Dr. Chris McGinley; Omar Crowder, Principal of Northeast High School; Maria Barnett, AP Coordinator for Northeast High School; Dianna Frank, Director of K-12 Services for the College Board; and several Northeast High School teachers, students and family members. Northeast High School is the only school in the District to offer the complete AP Capstone program, which the College Board debuted in 2015. It consists of two year-long courses, AP Seminar and AP Research. In the AP Seminar course, students collaborate and work with peer-reviewed academic sources, and give “TED Talk”-style presentations on real-world problems. Students then follow up with the AP Research course, where they plan and conduct studies to add knowledge where a research gap exists. Nine of the students have earned the AP Capstone Diploma, awarded to those students who earn college-eligible scores on both AP Seminar and AP Research exams, and in at least four other content areas. Five of the students have earned the AP Seminar and Research Certificate, awarded to students who earn college-eligible scores on both AP Seminar and AP Research exams. Throughout Pennsylvania, only 15 schools, including Northeast High School, offer AP Research, the program’s culminating course. Schools must apply for this rigorous program and must demonstrate a commitment to diversity and inclusion in their AP classrooms in able to offer the program. In the 2017-2018 school year, students focused their research on a wide variety of topics, including: attitudes towards predictive genetic testing; the media’s impact on racial self-perception; technology’s impact on parent/child relationships; teenage definitions of mental health; and factors that affect routine participation in mammograms; and deaf culture perception in the media. Students who have graduated from the program have been collectively awarded more than $500,000 in scholarship money for higher education. This fall, they will attend colleges and universities including: the University of Pennsylvania, Drexel, Temple, Lehigh, Pennsylvania State University, Arcadia, Albright, and the University of Maine.